This species is accepted, and its native range is DR Congo. Perennial; caespitose; clumped loosely. Basal innovations intravaginal. Culms erect; slender; 40-60 cm long; firm; 2-3 -noded. Culm-internodes unequal, the upper longer; terete; striate; distally glabrous. Culm-nodes pubescent. Lateral branches lacking. Leaf-sheaths deciduous; longer than adjacent culm internode; glabrous on surface to pubescent; outer margin hairy. Ligule a ciliolate membrane. Leaf-blades 12-18 cm long; 2-5.5 mm wide; stiff. Leaf-blade surface glabrous to pubescent. Leaf-blade margins scabrous. Leaf-blade apex attenuate. Inflorescence a panicle; embraced at base by subtending leaf. Panicle open; oblong, or ovate; 12-18 cm long. 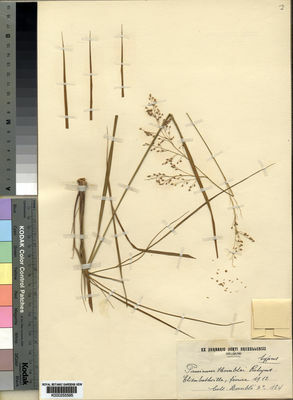 Primary panicle branches ascending; 1 -nate; subdividing 3-4 times; rebranched near base; 6-9 cm long. Panicle branches flexuous. Spikelets solitary. Fertile spikelets pedicelled. Pedicels filiform; unequal; 4-8 mm long; tip discoid. Spikelets comprising 1 basal sterile florets; 1 fertile florets; without rhachilla extension. Spikelets lanceolate, or ovate; dorsally compressed; acute; 2.5 mm long; falling entire; readily shedding fertile florets. Glumes similar; reaching apex of florets; thinner than fertile lemma. Lower glume ovate; 1 length of spikelet; membranous; without keels; 5 -veined. Lower glume apex acute. Upper glume ovate; 1 length of spikelet; membranous; without keels; 5 -veined. Upper glume apex acute. Basal sterile florets male; with palea. Lemma of lower sterile floret similar to upper glume; elliptic; 1 length of spikelet; membranous; 5 -veined; acute. Fertile lemma elliptic; dorsally compressed; 1.5 mm long; chartaceous; pallid; without keel. Lemma surface tuberculate (verruculose). Lemma margins involute. Lemma apex acute. Palea involute; chartaceous. Palea surface tuberculate (verruculose). Paniceae. Fl Agric Congo Belge 1998.